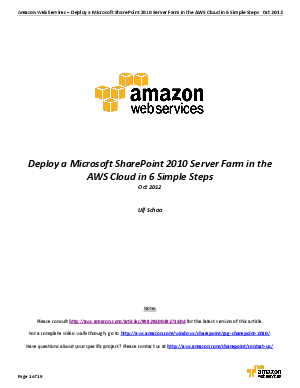 Learn how you can deploy a Microsoft SharePoint 2010 server farm on the Amazon Web Services (AWS) cloud infrastructure in 6 simple steps and save money on infrastructure costs. This SharePoint Reference Implementation Guide contains all the necessary resources to deploy a fully functional SharePoint Server farm reliably and repeatedly. It includes easy-to-launch sample deployment templates, PowerShell scripts, a reference architecture whitepaper, an advanced implementation Guide, and a step-by-step video tutorial series. Whether it's a single-server SharePoint Foundation solution or a full-featured SharePoint web application running on a multi-tiered SharePoint server farm designed for high availability (HA), AWS offers a secure and dependable environment for customers to deploy Windows Server-based workloads quickly and cost effectively in the cloud. Download the SharePoint Reference Implementation Guide today!